The Fragile X Files: Fragile X Writers Series - Is It Really The Happiest Time of Year? Fragile X Writers Series - Is It Really The Happiest Time of Year? I'd like to introduce you to Cindi Rogers, this week's guest Fragile X Writer. She is a mom to two boys with Fragile X who are actually men, now - ages almost 24 and almost 22. She is further along in her Fragile X journey than I am, and everything she says and does, I learn from. She's stupendously innovative in her techniques and strategies for success with her Fragile X sons. She lectures at the International Fragile X Conferences about her philosophies and her creative routes to success in raising her boys, and she shares her experiences at her blog, Mrs. Rogers Neighborhood. I am so, so lucky and honored to have her contributing to my blog this week! Define your best holiday experience. If I gave this request to each of my friends, the response would most certainly be different for every single one. For me, the definition has changed from when I was little to where I am now. When I was young it meant 2 full weeks with no school, playing in the snow, and the anticipation of presents. As I got older, it meant having a few days off work and lots of stress. Now that I am a parent myself, it means something totally different. I’m not sure what I thought it would look like, but I am sure I have modified my idea of that vision over time. When our boys were little, we attempted to mold our Christmas holiday into what we thought would be the ultimate experience. All of our ideas were based on either what we ourselves experienced as a child, or the things we wanted to change about those memories. My husband’s memories of Christmas were very happy ones filled with day-long celebrations and family. Not that every moment was fun-filled, but his overall memories of childhood Christmases were pleasant. For me, not so much. I wanted my own family so I could have the fairy tale. Of course, it isn’t realistic to think that we really could have the fairy tale, but it was a dream. Society’s idea of a fairy tale Christmas was riddled with debt, stress and overwhelm. I never thought about those facts….I just knew I wanted it. As toddlers, the boys received many gifts—more than should really be allowed in any household filled with humans. We tried to follow all of the "rules" when it came to the dinner, the decorations and the family time. We were well on our way to learning about how to throw a fairy tale holiday celebration. Once we were consumed with the knowledge of having 2 boys affected with Fragile X Syndrome, all of this changed. Our first few Christmases with the boys were spent attempting to mold them into our ideas. Joe was not an easy baby, so most of the day was used to try and appease him. Jake was content with spending his time doing his normal routine. The home videos of this timeframe show the true picture. There was not a speck of joy or elation over new toys or clothes. In fact, just the opposite. But, we pressed on. My family had a tradition of celebrating on Christmas Eve, and because they live out of State, that meant a blow-by-blow account by telephone. Chris’ family, on the other hand, lived close by. We spent Christmas Day with them beginning in the wee hours of the morning through dinnertime. Conforming to all of the expectations was exhausting! Attempting to get a "thank you" out of a child that literally didn’t speak was a challenge. Teaching a child to give hugs when we spent multiple hours in OT in an effort to overcome sensory issues was futile. Some things had to change! A change would require a mind shift from me and Chris. This was going to be tough. To give up my perception of what Christmas should look like was a loss for me. I cried for my lost dream. For Chris to give up having the same memories he had as a kid would be difficult too. Did we want to put our mark in the sand and continue to fight tooth and nail for our dreams? Or try to make it more of a positive thing for the boys? That was the question. I think we had to try the positive approach. How would we be able to set some kind of routine based on something we could only practice once a year? This would be a challenge. The anxiety surrounding opening the presents was clear from the boys’ first Christmas. They never seemed interested or excited about this task. The second or third year, I decided to try a sort of "tolerance build-up" approach. I took a trip to the dollar store and bought 30 $1 nonsense things. They didn’t need to be of super high interest, but some interest would be good. Food items, small snacks, candy, Slinkies (sensory), chewy things, etc., all hit the basket. I went home and wrapped each one and placed them in a box. Beginning on the 9th of December (15 days before Christmas Eve—don’t ask me how I came up with this) we asked the boys to pick one item from the box. We allowed them to wait until they were ready, and then open it. At first we didn’t make a big deal about it. After a few days, we started to use a "side dialogue" method to encourage imitation. This involves me and Chris talking to one another, saying the things we wanted them to mimic. We would say "Thanks, Dad" or "Thanks, Mom" and giving a "high 5". I think we were starting to see improvement in the anxiety department over the simple task of opening the gifts. After about 10 days of practice, we were able to achieve the "high 5", but still no "Thanks", which was ok with us. By the time Christmas Eve arrived, there was little or no anxiety over gifts. The following year, Chris and I decided to try and focus more on things the boys liked to do during the holiday rather than push our idea of it on them. Jake was always very frightened by the Christmas tree itself. I think the sensation of the tree’s texture gave him an extreme aversion. Therefore, he never wanted to help place the decorations on the tree. Joe is so sensitive to everything around him, that the whole radiation of stress from everyone caused him to become a seasonal monster. On numerous occasions we would hear things from the school like "oh, well, we won’t plan to start any new materials or approaches until after the holidays", or "let’s plan to get to that in January". No wonder Joe was feeling this stress—it was all around him! His own home was no exception. Both boys did seem fascinated by the numerous displays of lights that appeared everywhere this time of year. We could see that this was a constant interest area. Even the lights on the tree seemed interesting, even though we didn’t want to touch them. That seemed to be our ticket! We had noticed a list of lights displays published in the newspaper every year, so we looked that up. We planned our path and prepared our trip. At dark on Christmas Eve we packed a thermos of hot cocoa, cups, Christmas CDs, blankets and a few diversions. We all dressed in our pajamas and loaded ourselves into the car. We traveled around the city taking in all of the spectacular lights. The evening was a success. We headed home and tucked the boys into their beds in preparation for a busy Christmas Day. Another obstacle that we faced the following year was the constant invitations from family to attend parties. Up to this point, we had not had the best experiences. Chris was from a very large family and there was a lot of demand. Most were not extremely knowledgeable about Fragile X, and we didn’t see them often enough to really keep them in the loop. We decided to have a pot-luck party at our house, on the boys’ turf. Somewhere in the neighborhood of 50 people came. There were lots of kids, lots of noise, and lots of food (lots of smells). Overall, it went pretty well. No one cared if Joe ran around his house with no shirt on—it was his house. No one cared if the boys cried for some reason—we didn’t either. We had all we needed right at our fingertips. We learned what to do and what not to do the following year. Because we felt like it was important to include family in the boys’ lives, we made it an annual event for many years to come. As the family dwindled, we transitioned to an annual party for friends, which has become an event that we look forward to with anticipation (all of us). The boys’ are involved in the countdown and the preparations. As the years have passed by, and our boys have grown older and more tolerant, things have greatly improved. 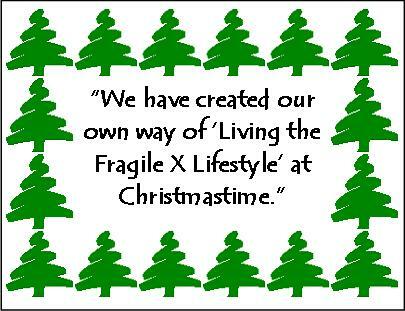 We have created our own way of "Living the Fragile X Lifestyle" at Christmastime. 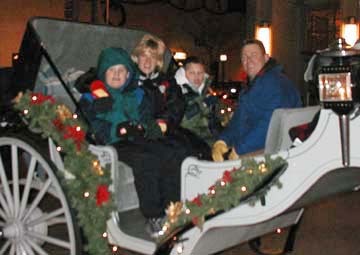 We all enjoy taking our Christmas Eve carriage ride downtown to view the spectacular city lights displays. We don’t have as much family nearby, so it’s a fairly quiet evening. We still open gifts from my family and share the experience by telephone. We begin Christmas morning by opening gifts at a leisurely pace with no pressure. We continue to practice using good manners with each one. We share a specially prepared Christmas dinner with a few friends and family. The boys’ even enjoy eating "a special dinner" in the dining room, with cloth napkins placed on their laps. We’ve learned that a few high interest gift items are much more meaningful to them than the number of things they open. I have also realized that this time of year marks time for us. What I mean is that each year we sit back and say things like "Oh, remember when Jake was only as tall as the table", or "remember when they wouldn’t even sit with us at the dining table". It’s a time for reminiscing and for reflecting on how far we’ve come. That’s a gift for me. Now I know that when I mourned the loss of my dream, I was really mourning was the loss of society’s dream. My own dream actually came to light. To see our boys enjoying and participating in what is meaningful to all of us, really does make it the happiest time of year.